1 Cut 1/2-inch off stem end of onion and finely chop to make 1 tablespoon. Cut remaining onion crosswise into 1/2-inch-thick slices; set aside. 2 Combine chopped onion, 6 tablespoons Hellmann's® or Best Foods® Light Mayonnaise, 1 tablespoon lime juice and jalapeno peppers in medium bowl; set aside. 3 Combine remaining 2 tablespoons Mayonnaise, 2 tablespoons lime juice, Knorr® Chicken flavor Bouillon and chipotle chile pepper in medium bowl. Coat onion and pineapple with 1/2 of the chipotle mixture, then coat shrimp with remaining mixture. Grill or broil until pineapple and onion are tender and shrimp turn pink. Chop onion and pineapple. 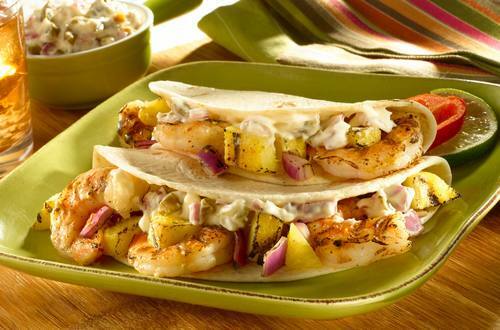 4 Serve shrimp, onion and pineapple in tortillas and top with jalapeno tartar sauce. Garnish, if desired, with chopped cilantro.